The Star Trac Pro Upright Bike boasts unique features that will ensure you’re amongst the coolest in the gym. First, there is an automatic fan that acts like the breeze you would feel while mounted on a regular road bike - no constant wiping off of sweat. The Star Trac Pro Upright Bike boasts unique features that will ensure you’re amongst the coolest in the gym. First, there is an automatic fan that acts like the breeze you would feel while mounted on a regular road bike - no constant wiping off of sweat. Next, stay safely and securely strapped in with special inline-skate style pedal straps. 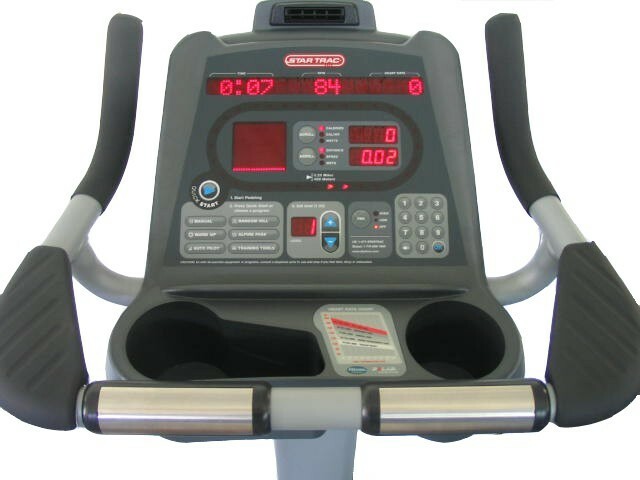 In addition, a belt-drive system takes the drag out of pedaling a stationary bike and gives you a smooth and quiet experience. The Certified Pre-Owned Star Trac Pro 6330 protects your heart, too, by employing a “Dynamic Heart Rate Control® System” and wireless Polar® telemetry. 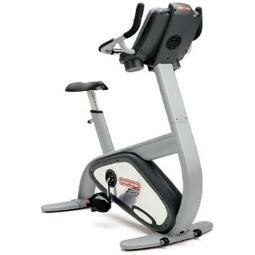 You’ll have 11 programs to choose from, and 2 fitness tests to gauge your progress, and with the simple “easy-up” seat adjustment mechanism, mounting and dismounting this bike is not a problem. The Star Trac Pro’s frame is a heavy-duty, corrosion resistant aluminum that will support up to 350 lbs and it displays workout data on a sophisticated, yet easy-to-use display. And don’t worry about compromising good looks for all this technology: the Star Trac Pro comes with sleek design and styling, giving you the aerodynamic feel of a top-of-the-line road bike.